the intersection: What happened to Second Screen this week? What happened to Second Screen this week? What a crazy week. As if it wasn't enough for NATPE to be taking place in Miami (with some great research and stats published about second screen), there was a ton of consolidation activity in our industry (Dijit/Viggle, IntoNow from Yahoo, Digitalsmiths/Tivo) and some rebranding by GetGlue. 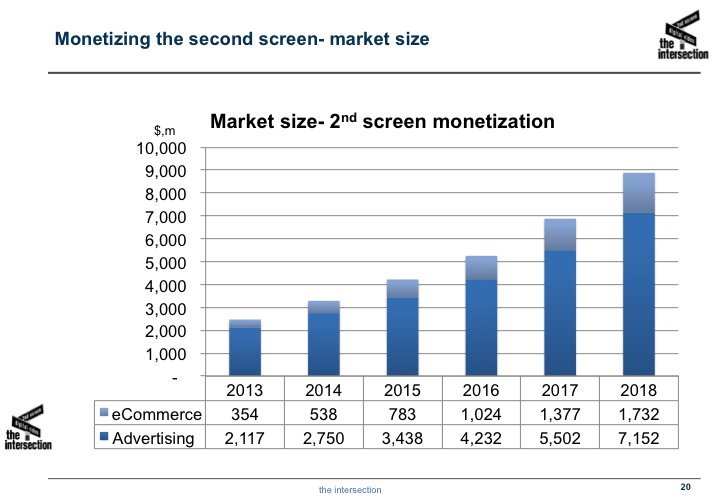 At the same time the 2nd Screen Society (S3) published a teaser on its new research about monetizing the second screen, and then Gigaom and TechCrunch wrote some pretty disparaging views, with Gigaom reverting to the salacious headline of "Social TV is Dead". It's no surprise that I received several requests from S3 members and from kindred spirits in the Twitter-sphere (thanks @Gip89) to attempt to help make some sense of all the news. My head is spinning, too. Let's try to pull apart this ball of string by looking back at the fundamentals of the space and what each of the news events might mean, keeping in mind that while this week might have seemed like a "revolution" in terms of the number of momentous events taking place, its been a relatively progressive "evolution", with each of these events building up over time in a manner similar to what we have been forecasting at conferences and in our research. This is a bit like an eagle hatching from an egg--to those watching on the outside, it is a very momentous occasion, while for the bird itself, it is a milestone along his life journey that has been taking place inside the egg for sometime. First, the fundamentals. As we emphasized during our "2nd Screen by the Numbers" session at CES, this market place continues to grow at a rapid pace not because of the development of great user experiences on various apps of smartphones or tablets, but purely because of the massive proliferation of those smartphones and tablets and the ever present consumer behavior to turn to them in any lull of activity during entertainment (TV or otherwise). The opportunity presented by the second screen phenomena is to capture this opportunity with an engaging consumer experience related to their video experience (companion or viewing) rather than letting email or Angry Birds seize it instead. We spend a decent amount of energy across 30-pages of research on how successful business models are developing to monetize this change in consumer behavior, but regardless of our ability to capture the opportunity in terms of consumer engagement or monetization, that behavior will continue in larger and larger numbers. NATPE. Chris Tribbey wrote up a pretty decent summary of the content creators' panel during NATPE discussing the insights from the CEA/NATPE research, presenting some GREAT stats about second screen usage and more importantly, a strong view from content creators ("Show Creators See Second Screen as Permanent"). Yahoo's IntoNow. Yahoo made a decision to shut down IntoNow, the synchronous enhanced viewing experience app they acquired only three years ago. I think two developments lead to this decision by Yahoo. 1) it wasn't a very engaging experience (too broad and shallow) and was likely not attracting a ton of consumer engagement, and 2) Yahoo's Screen app is taking off and has cemented their view that focusing on engaging the consumer around the viewing experience was a more attractive monetization play. Let's face it, Adam Cahan founded Auditude, IntoNow and is now Marissa's right hand man for all things mobile video at Yahoo--he didn't do this without thinking it through. Digitalsmiths acquired by Tivo. 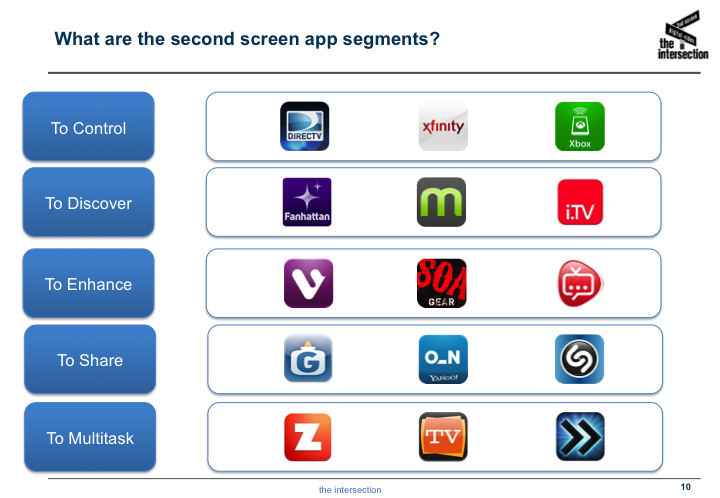 What a great validation of how important Discovery is in the second screen ecosystem. Led by Ben Weinberger, Digitalsmiths has been quietly winning most of the MVPD operators in the U.S. with their personalization and recommendation platform. The cash purchase for $135M by Tivo is certainly validation that the space is valuable for investors, but more directly indicates that Tivo is going to keep moving into the direction of creating great viewing and companion experiences for the living room (their current experience on a smartphone and tablet is already amazing and getting better all the time, lead by Tara Maitra and Evan Young). Dijit acquired by Viggle. Viggle is perhaps one of the most successful at monetizing the second screen companion experience (a short section in our research sheds light on their success). Dijit's Nextguide is perhaps the most engaging consumer Discovery experience (yes, better than Fan), with significant broadcast partnerships on their tune-in "reminder button" feature. I am convinced that with Jeremy Toeman leading the UI/UX and Greg Consiglio leading the monetization, this marriage will be a happy one for their shareholders, their customers (brands and TV networks) and consumers. The Grammy's. Why is this important? I am sure a ton of stats will come out this week about how many tweets, etc, were pushed during the broadcast. But did you see that Chromecast commercial? Somehow Google managed to create the ultimate Discovery and Control powered second screen experience, stealing that opportunity from Apple, Netflix and Samsung. They have not only created a pervasive and passive experience that seamlessly allows consumers to "cast" their viewing experience from their second screen to the first, but by using the DIAL protocol, the second screen is then freed up for a companion experience (or synchronous advertising - see our research). The evidence of the commercial during the Grammy's means they are SERIOUS about being successful with their $35 dongle. Apple, Sony, Samsung and Roku should take heed. GetGlue. What does that mean to you? It launched many, many moons ago as an attempt to create a social network around your viewing (and reading and wine drinking) habits, letting consumers check-in to a show and share with their Facebook or Twitter friends. i.TV bought them last fall and no surprise has decided to re-brand them into something that speaks to the opportunity Shazam is busy uncovering--tvtag. Despite Gigaom's view on this, I think this is positive in that it means the i.TV management recognizes the opportunity (engagement with the consumer at specific points of the viewing experience) and the threat (Twitter is chasing this and so is Facebook). Will they be successful? Who knows, but consumer behavior will continue irregardless. Shazam. Perhaps more interestingly, Shazam is making a big push during the SuperBowl this year to see if their momentous growth in active users can move the needle on advertising and consumer engagement during the world's largest live viewing event. While I had been skeptical over the previous 18 months, their new CEO Rich Riley (joined in April, 2013) seems to have turned the ship in the right direction, racing towards a UX that both engages the consumer and provides a monetization platform. And a partnership with Facebook isn't a bad idea either. Watch this space (and that Jaguar commercial). 1 of which is the sharing or social aspect. 2) All of the hype from Gigaom and TechCrunch in the last 3 months has been that the Social TV battle is down to Facebook vs. Twitter--neither of which is going anywhere or walking away from TV. 3) Read the last 3 paragraphs and you will see both confirmation that they still believe in point 2 AND that the right engaging experience still needs to be developed--confirmation of the fundamentals above (that the consumer behavior will continue despite the poor UX). Conclusion: a salacious headline that certainly made MANY people read the article. Reviewing the facts with the lens of the industry fundamentals sheds a different light on each of these events, and in summary they all point one direction: It's ALL second screen!. The proliferation of the devices, the changing millenial behaviors (preferring to view on their 2nd screen rather than the big screen), the early success in monetization of some companion and viewing business models, and the consolidation of the space which means more marketing and development weight behind the strategies to lead to successful consumer engagement (and monetization).